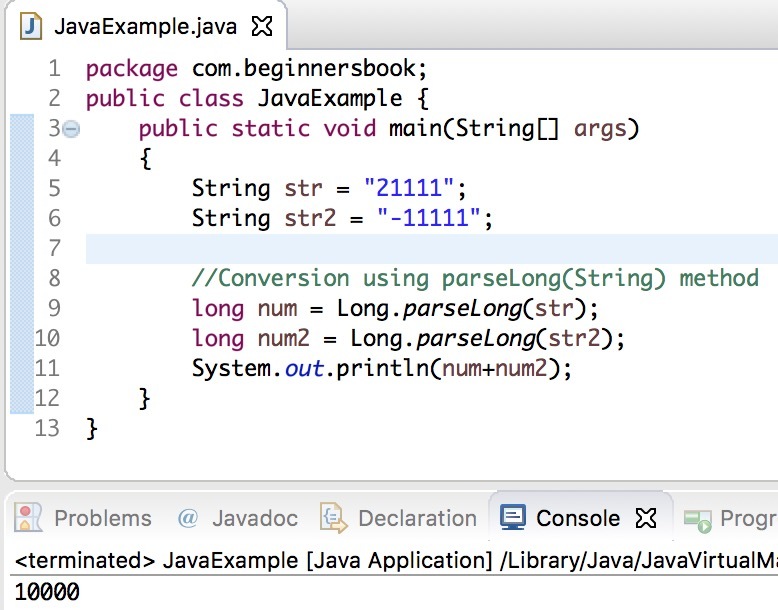 In this tutorial, we will see how to convert String to long in Java. There are three ways to convert a String to a long value. Long.parseLong(String): All the characters in the String must be digits except the first character, which can be a digit or a minus ‘-‘. For example – long var = Long.parseInt("-123"); is allowed and the value of var after conversion would be -123. In this example, the string str2 has minus sign ‘-‘ in the beginning, which is why the the value of variable num2 is negative. Long.valueOf(String): Converts the String to a long value. Similar to parseLong(String) method, this method also allows minus ‘-‘ as a first character in the String. Long(String s) constructor : Long class has a constructor which allows String argument and creates a new Long object representing the specified string in the equivalent long value. The string is converted to a long value in exactly the manner used by the parseLong(String) method for radix 10.